In a typical building, many contaminants and air pollutants, such as dust and dander are constantly being produced. These contaminants get sucked into your HVAC system and re-circulated on average five to seven times per day! Poor air quality can impact your employees’ health, which results in lower productivity, illness and lost revenue. Health effects caused by poor indoor air quality range from general malaise, such as fatigue and headache to more serious symptoms like asthma and infections. Indoor air quality issues represent approximately 60 percent of employee complaints, according to the New Jersey Department of Health Public Employees and Occupational Safety and Health. New Jersey is one of a few states to have mandated indoor air quality standards that cover air contaminates and building-related illnesses. One way to ensure healthy air and a healthy system is with regular industrial HVAC maintenance and duct cleanings. Commercial HVAC companies will clean your air ducts to get rid of nasty pollutants. Without proper cleaning and maintenance, pollutants build up on the internal components of your industrial HVAC, including the blower, heat exchanger and cooling coils. This buildup causes dust and dirt to pass through your ducts and enter your business. Dirty ducts make your system work harder, reducing its efficiency and lifespan, while raising your utility bills. Clean ducts increase your return on investment with less wear and tear on the commercial HVAC system. During cleaning, your professional industrial HVAC technician will also access any issues with your system, alerting you before they become a big problem and a big repair bill. When you clean your air ducts, you are making an investment in your business and your employees. Healthy air equals healthy employees. Duct cleaning should be a part of your routine facility maintenance and done on a regular basis, as recommended by your commercial HVAC professional. In addition to scheduled maintenance cleanings, there are several catalysts for scheduling an immediate cleaning. Do your ducts have visible mold? If you answered yes to this question, you should hire a professional to get cleaning. Mold is a type of fungus that can cause mycotoxins, or “toxic molds.” Breathing this in can make people sick and cause issues for people with respiratory or immune problems, and especially individuals with asthma. Once again, an answer of yes to this is grounds for an immediate call to an HVAC specialist. Any infestation of vermin (i.e. rodents or insects) is a serious problem for your heating and cooling system. Rats and mice can shed their fur into the ducts, and airborne particles from their droppings can carry pathogens that cause Hantavirus Pulmonary Syndrome, which is fatal 40 percent of the time. Has your building recently been remodeled or had work done to it? Your ductwork may need to be cleaned if your building had work done. It’s especially important if there has been asbestos abatement or lead paint removal, as these particles are toxic and require special handling. Also, if your ducts were not sealed off during renovations, dust from the work can linger (we all know how far dust from sanding can travel) and go anywhere the air flows so clean out your system as soon as renovations are done. 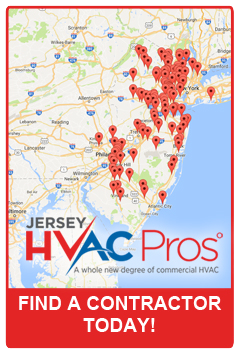 To have your commercial HVAC system serviced and your ducts cleaned, contact the Jersey HVAC Pro nearest you. They can answer your questions and get you on track to have a healthier commercial HVAC system for your employees.